While most people realize that the ecosystems of the Grand Canyon are very different between the cool pine-treed clad high elevation rims and the dry and hot cactus dotted bottom, most people are not aware that the floor of the canyon has three different desert ecosystems within its walls. In Grand Canyon, plants from three out of four of North America’s great desert regions are represented. The three regions (Great Basin, Sonoran and Mojave Desert) make their appearance through plant life as you travel down river and down in elevation on your Grand Canyon rafting adventure. The Chihuahuan Desert of Northern Mexico and southern Texas and New Mexico is the one desert not represented in Grand Canyon. While on your rafting journey down river, different plant species emerge along the way. For example, at the beginning of your trip, Lee’s Ferry, at mile 0 and 3107 feet in elevation, there are the sagebrush and shad-scale species of the Great Basin Desert. 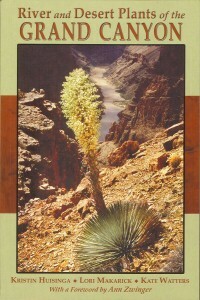 A striking and common plant in this region is the Utah Agave, with its tall flowering stalk and broad spiked leaves. Going on down river, at approximately mile 39, plants specific to the Sonoran Desert region begin to appear on the slopes. The thorny mesquite and catclaw acacia trees are some of the plants from the Sonoran Desert that are first spotted from this point down. Finally, at around mile 156, plants of the hotter and dryer Mojave Desert region begin to appear, such as creosote bush and certain cholla cactus species. While there is some overlap of hundreds of plant species from the different regions, many plants cannot grow above or below specific elevations within the canyon. The octopus armed Ocotillo makes its first appearance at mile 154, and none of these bizarre Alice in Wonderland cacti are seen above this river mile. And the tall, movie set-like Barrel Cacti are not seen before river mile 91, near Phantom Ranch. Interestingly, when an 1889 photographic study was recreated 100 years later in 1989, the photographic results showed that the Barrel Cactus had moved over 10 miles upstream in 100 years. This movement upstream is theorized to be due to warming temperatures and less hard frosts in the region. 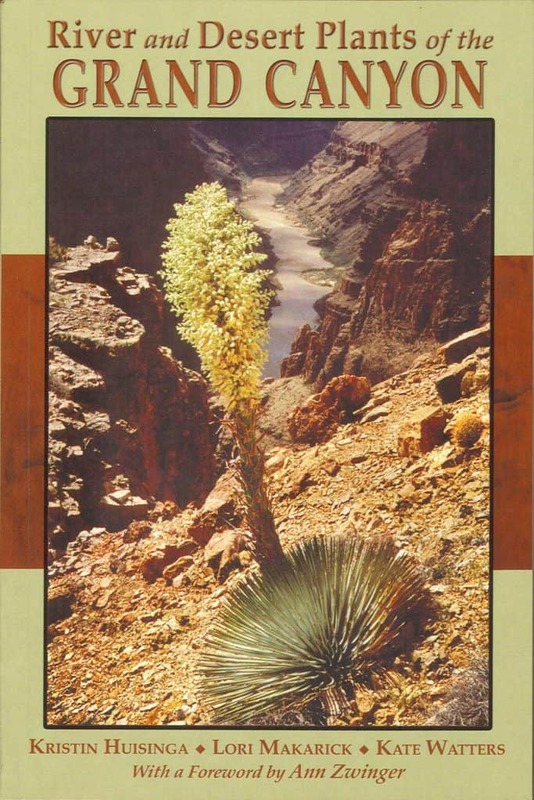 If you are interested in plants, a wonderful book to take along on your trip or purchase afterwards is River and Desert Plants of the Grand Canyon coauthored by AzRA guide Kristin Harned (Husinga). This book not only has beautiful and detailed color photos of the plants, but also lists Native American medicinal uses of the plants along with unusual facts about many of the species.